taviaclark.wordpress – Page 2 – School Librarian | I will make everything around me beautiful, that will be my life. 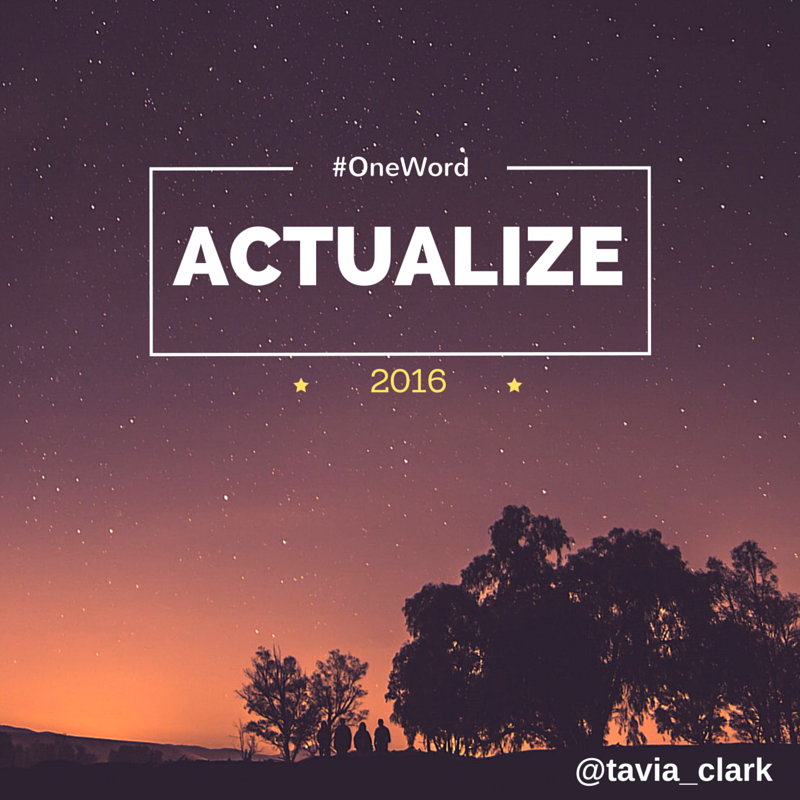 It’s hard to pick one word which sums up your goals for the upcoming year. I’ve been doing a lot of reflection over the holiday break and I keep coming back to one thing – I want to work harder to actualize the ideas/projects/dreams that I create. This year I want to push myself to turn my ideas into reality by taking risks, believing that I’m good enough and allowing myself to fail forward. The past year has had its fair share of ups and downs. The very beginning of the year started on the lowest low point I’ve had; Bob and I had to make the decision to say goodbye to Timory. I thought the sadness would never go away. And, it hasn’t gone away entirely. I’m still heartbroken that she’s gone, but 2015 turned into a year of amazing opportunity and growth. Along with Mollee Holloman, my partner in crime (and the Amy to my Tina), I feel like I’ve accomplished so much professionally – rocking a new position within NCSLMA, hosting multiple Twitter chats, helping to turn ‪#‎YearofYA‬ into a reality, launching our website Quick Tech by TM, presenting at my first state conference (and countless other professional presentations), being accepted into NCDLCN, collaborating and bringing elementary and high school students together…and so much more! I will be forever indebted to Mollee for her willingness to try anything, no matter how much work it will take or how crazy it might seem. It’s so much easier to take risks with a good friend by your side! Her passion and excitement are so contagious! I can’t wait to see where 2016 takes both of us!! Here are some of my favorite tech tools and books from the past year! Participate Learning (formerly Appolearning) – This site is so awesome for productivity and collaboration. It allows you to create collections of tools, resources, documents, etc and share those collections with others. It has a zero learning curve, which makes it an easy tool to share with colleagues and students. Check out some of my collections here. Bitmoji – Can we just say FUN!! There are many uses for this app/web extension, but my favorite use if for fun! QuickTweet – This Chrome extension is awesome if you have multiple Twitter accounts that you regularly use. It’s annoying to have to sign in and out of Twitter each time you want to post from a different account and I don’t always want to use Tweet Deck – enter QuickTweet. After a one time set up, you can easily click the icon in the extension bar of the Chrome browser and choose the Twitter account you’d like to use. The extension automatically signs you in to the account in seconds. This is a huge time saver! Sphero Sprk – It’s amazing how much fun and learning these little devices can create! From the first time I was able to test one out, I was hooked. Now, after buying two for my library, my students ask me everyday if they can play with the Spheros. The learning possibilities are only as limited as your imagination. I’m super excited to add more of these devices to our collection! Bring on the chariot races and mini golf!! Red Queen (audio book) – Loved this one and can’t wait for the sequel. It’s an awesome story of a strong female heroine who, upon discovering her true power, is forced into the world of the elites. There’s blackmail, suspense, and lots of twists and turns. Anyone can betray anyone. How It Went Down – This books is powerful and heartbreaking in the way that only a story that is so realistic and timely can be. Everyone should read this book. Through the Woods (graphic novel) – The illustrations in this book are amazing. It’s very creepy horror, so read it with the light on! The Martian (audio book) – Listen to this book!! The science is totally accessible and not at all daunting. There is tons of humor, sarcasm and the suspense is just right. It’s different from the movie, so read the book first! You – Caroline Kepnes has managed to write the creepiest book I’ve read since the I Hunt Killers series. This book isn’t for everyone. It’s horrific and creepy because it’s so completely realistic. I couldn’t stop thinking about how our digital footprints impact our lives while I was reading. Furiously Happy (audio book) – I am in love with this book. It’s honest, heartbreaking, hilarious and literally, furiously happy. My list of favorite things could go on and on…Happy New Year to everyone! Our first time hosting Hour of Code events in the CCHS Library was beyond AWESOME!! It was a huge success and the students left, each bell, excited and wanting more! I even had numerous students who didn’t sign up for the special events begging to have another coding week at CCHS to continue the fun and learning. Their excitement has taught me that every week should be Hour of Code week and I’m working on ideas for making coding more accessible and fun for both students and teachers. It’s my hope, that each time we do coding activities and events, more and more students and teachers will participate. Maybe we can even have 100% participation during next year’s annual Hour of Code. I’m so excited that our students are embracing coding and programming and using their own time to work through lessons in Code Academy. Each day they’re completing more exercises and the best part – they’re proud of themselves, sharing their learning and successes with other teachers and students! You know Hour of Code made an impact when students choose to keep learning on their own. I’ve been so excited to read what everyone else did during Hour of Code! Feel free to leave your experience with Hour of Code at your school in the comments! This year at the annual NCSLMA Conference, I attended an awesome coding session with Sedley Abercrombie. In her session, Sedley discussed how she brings coding into the library, not just during Hour of Code, but all year long. I was inspired so much by her presentation, that I decided, no matter how busy I was, I would organize an Hour of Code event in the library this year. I have included coding stations and activities in past Maker Space events, but I haven’t had an entire event based on coding and computer science. This is definitely something that I’d like to do make a regular part of the library program at CCHS, so I thought that the Hour of Code week would be the perfect time to build enthusiasm and form a base group of students who are interested in coding and programming. Next week, I have 25 students who have signed up to spend their entire hour long lunch bell with me in the library to work on coding games, tutorials and Sphero challenges. We will host them in the library, along with the other 100+ students who eat in there each day. I am going to rope off our cafe table/big screen TV area of the library and make that coding central for Hour of Code. Not only does this give the participating students prime seating and space to play, it also ensures that all of the other kids eating in the library will be able to see what’s going on. My hope, is that through next week’s Power Hour events, I will gain more student interest in coding. To keep all of the resources easily accessible, I’m working on a Weebly site for our school’s Hour of Code. This site will also make resources available for teachers who might want to experiment with their own ideas for Hour of Code in their classrooms. In addition to Hour of Code during Power Hour, I have three classes signed up to participate during the regular school day. Of the three classes, one is advanced level Math and two are advanced level Art classes. In the Art classes, we will do two full class periods of Hour of Code; day one will focus on tutorials, logic and problem solving, while on day two we will practice our new skills by using Tickle (IOS app) to code Spheros to draw. I’m hoping that the enthusiasm I’m already seeing from the students and teachers will grow and spread throughout the building! In addition to just participating in Hour of Code on their scheduled day next week, I’ve also signed each student up for a special group in Code Academy. They will be given their unique log in and directions on how to navigate the site to complete units. This site is great because I can track their progress as they explore various coding languages and complete complex work. As they complete a unit, they will come see me in the library for a prize. I’d love to hear more about how others are organizing and rolling out Hour of Code! Please feel free to comment and share! 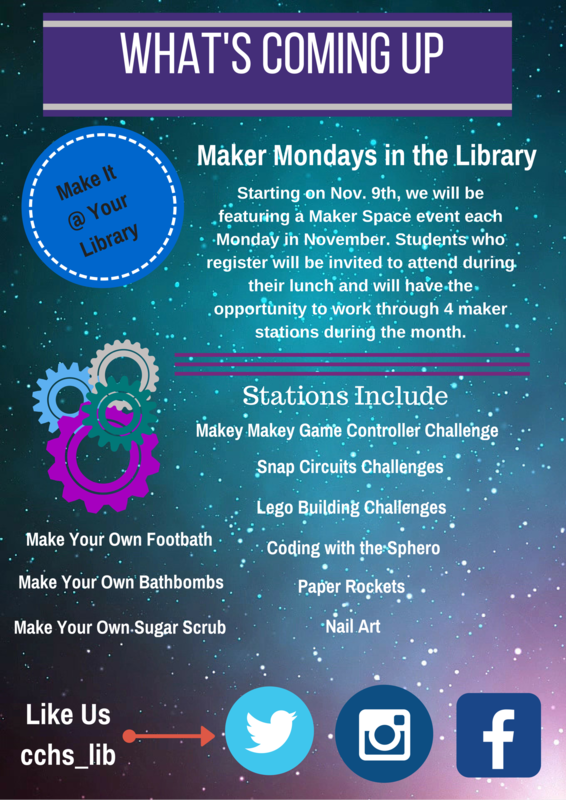 During the month of November, my assistant, Mrs. O’Briant, and I decided to have Maker Monday events during the last 4 Mondays. Last year, all of our Maker events had a theme focus (i.e. May the 4th Be With You – Star Wars and Alice in Wonderland). Since I was out so much in October, we decided that we would host events that students would rotate through, throughout the month. Our events for Maker Mondays has two focuses. We featured more crafty maker events that allowed students to create footbaths, bath bombs, sugar scrubs and do nail art. We also had stations that were more technology and engineering focused, such as Makey Makey game controller creation, LEGOs, Snap Circuits and paper rockets. Students signed up and we scheduled them accordingly during their lunch. While this gave us the opportunity to have more students participate, in hindsight, 30 minutes wasn’t really enough time for all of the stations. Regardless of the rush, all of our students had a great time! I’m excited to continue with our Maker events during the rest of the school year. Who knew something so small could be a game changer? I know that I should be creating reports to document all of the data from the library program. I mean, it’s really Librarian 101. Even though I always have the best intentions, collecting the data, printing out multiple reports, even putting it all in a spreadsheet, I rarely find the time to actually create something out of it. You see, I am VERY creative when it comes to instruction and planning and working with teachers, but anything artistic stumps me. I just wasn’t born with that ability, so creating beautifully laid out reports is difficult for me. 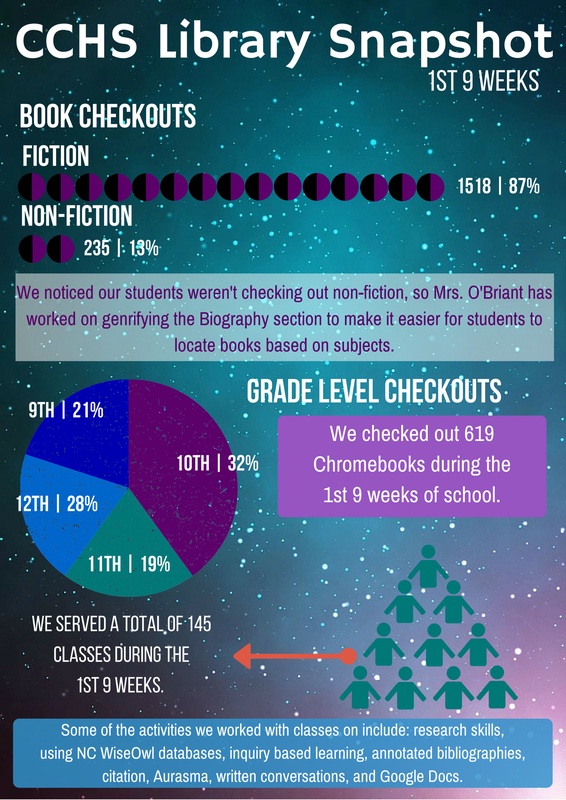 I promised myself at the beginning of the school year that I would make myself publish library reports. In order to make this an obtainable goal, I decided to publish one every 9 weeks. While that’s a long time to go between sharing information, I do stay current on the library’s social media accounts, so I’m sharing day to day in a more informal way. This morning when I opened my email, I had about 7 replies to my snapshot report – all positive comments! I had no idea that something so simple, outlining basic data about circulations, Chromebooks, classes served and our makerspace events would warrant actual replies form my colleagues. What I saw as a report that showed me not doing enough, didn’t read that way at all to everyone else. Reading their emails warmed my heart and made me feel so proud of my work. I realize now that what might seem simple and lacking to me, can be very eye opening and impressive to others! I think what this taught me is that I’m my own toughest critic and that producing and sharing actual data about the library program is not just a good thing, it’s necessary!